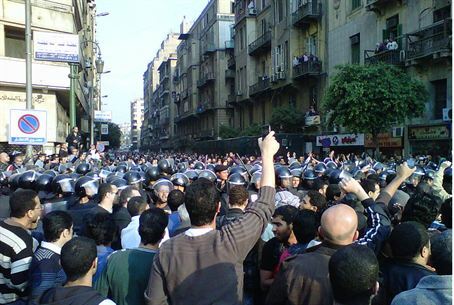 Egypt copies Iranian tactics and uses brute force against Egyptian protesters, killing 100. Israel evacuates diplomats and their families. Egypt copied Iranian tactics of two years ago and used brutal force by police and prisoners against anti-government protesters Saturday, killing at least 108. The army is standing by but has not taken part in stamping out opposition rallies. Meanwhile, Israel was the first country to evacuate diplomats and their families. The Republic of the Philippines is preparing to evacuate 6,500 Filipinos working and studying in Egypt in case the situation grows worse. Israel's Foreign Ministry said it brought in special flights to carry diplomatic families and 40 other Israelis visiting Egypt who wanted to leave the country. The Israeli government so far has remained silent about the growing crisis, but Jerusalem unofficially has expressed concern that if Egyptian President Hosni Mubarak is forced to resign, a long period of instability might follow. The Palestinian Authority has expressed solidarity with Mubarak, who has ruled Egypt with an iron hand for 30 years. U.S. President Barack Obama stated, "The people of Egypt have rights that are universal" and added, "Suppressing ideas never succeeds in making them go away." He spoke with Mubarak for 30 minutes on Friday. Protesters followed the lead of Tunisians two weeks ago who brought about the end of the rule of Zine El Abidine Ben Ali. Egypt has responded with club-wielding riot police who also are using live fire. The death toll in the protests has ranged from 75 to 108, and at least eight were killed by gunshots near a Cairo jail after several police stations and government buildings were set on fire. “The most important point … is that the barrier of fear has collapsed, has fallen. Egyptians now are no longer terrified of the security apparatus as they used to be,” he said. Egyptian forces Friday took into custody Nobel Prize winner Mohamed ElBaradei, the former chief of IAEA, the United Nation’s nuclear watchdog agency, and prominent anti-government figure who returned from Vienna to join the protests. He was placed under house arrest. Despite his support from liberal movements, ElBareidi, as head of IAEA, backed Iran's claims that its nuclear program is for civilian purposes, and campaigned against Western sanctions. He is a supporter of the Muslim Brotherhood and told Der Speigel last week: "They have not commited any acts of violence in five decades." Relative quiet has returned to the streets as Egypt continues to keep social Internet networks and cellular phones shut down, although partial service was restored Saturday afternoon.